If you know how to use Instagram or Twitter or Instagram for marketing, hashtags should be familiar to you. But do you know how to use them strategically? Hashtags are everywhere these days. You see them on Twitter, Instagram, Pinterest, Google+, and Facebook. As a marketer, you can’t ignore them. You need to know how to strategically implement these tagged topics. Hashtags can expand your content reach, amplify your brand, target your market, get your content found, improve your SEO, and more. 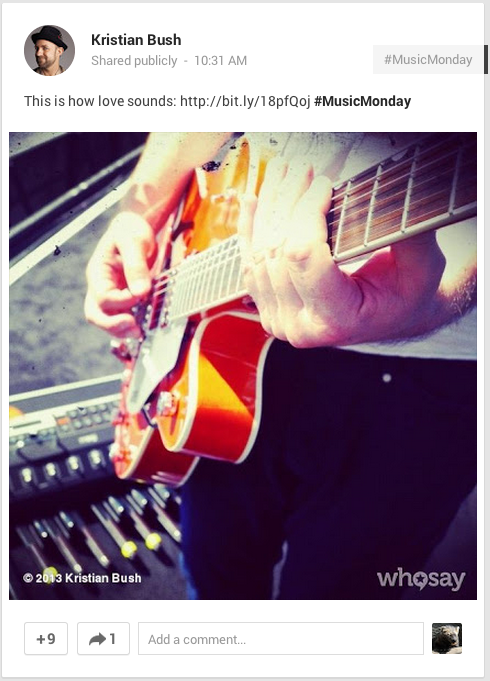 In this article, I’ll give you three core hashtag strategies for any social site. I’ll also include a brief intro to #hashtags for you newbies! Most of you know what a hashtag is by now. For those who are just starting out, here’s a brief outline of what they are, and how they started. Hashtags were first introduced on Internet Relay Chats (IRC’s were live chats and messaging - kind of a precursor to the social sites we use today). They became popular on Twitter, where they were initially used for “tweet chats”. Tweet chats are like open group discussions around a particular topic. 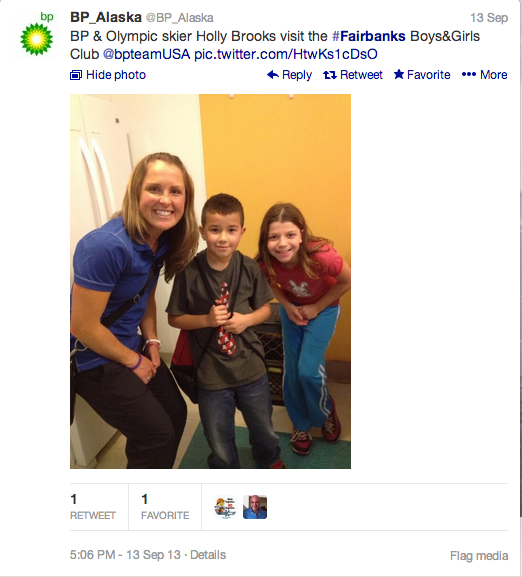 The essence of the “tweet chat” is still relevant in how marketers can use hashtags today. Hashtags are a word, or group of words after the # sign (like #hashtag, #buylocal, #marketing or anything else). If you’re more technically inclined, you might know them as a metadata tag. For marketers - you’ll know them as a way to engage your brand with your market. Brand and campaign specific hashtags are tags that you make for your own business. Use them to market your brand and promotions. I’m defining a brand hashtag as your company name or a company tagline. Make a brand hashtag that is unique to your business. Make a brand hashtag that defines your business. Use your brand tag as your signature tag. Get people to use them, so that your brand gets marketed too. I’m defining a campaign hashtag as a hashtag made for each of your marketing campaigns. For example, if you are having a sale at your store, you can make a unique hashtag to further promote this short-term promotion. Get people to use them, and your campaign gets extended reach. You create your own brand hashtag. Make it your company name, or a tagline that people know (or will know) about your business. Use it as your central business tag, that you - and your customers - can use anytime, and on any social site. Make a brand hashtag that is unique to your company. Do a search for the hashtags you’re thinking about. Search for it on Twitter, Instagram, Pinterest, Google+ and Facebook before you implement it. If your company name is common, choose a different hashtag name. You also want to keep your brand hashtag pretty short, and easy to spell. You want your customers to remember your tag, and use it correctly. For example, if you are a retailer of discount designer furniture, use #discountdesigns, but don’t use #wegetthebestdiscountdesignsforyou . KitKat uses a brand hashtag. They use their tagline: #HaveABreak. They consistently use it on all their social sites from Twitter to Google+. 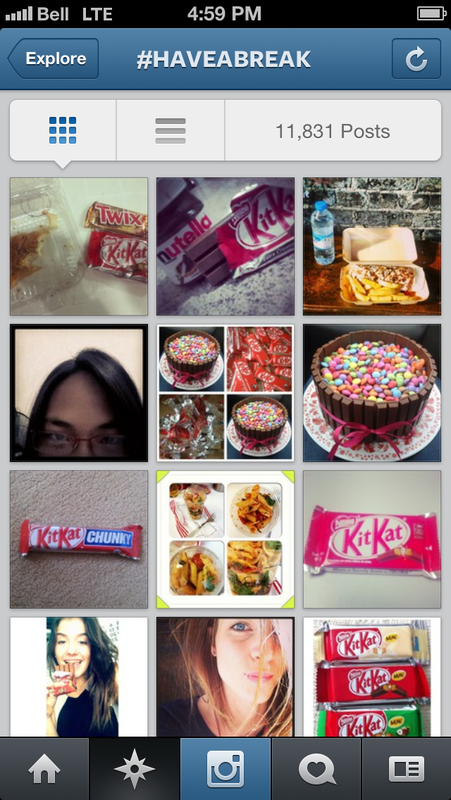 Their consumers know their brand hashtag, and they use it to engage with the social KitKat community. Consumers get to share their photos with the #HaveABreak community - and Kit Kat gets lots of authentic images of people enjoying their product. Customers use it to be part of the #HaveABreak community, and Kit Kat uses it to engage and respond to customer mentions. 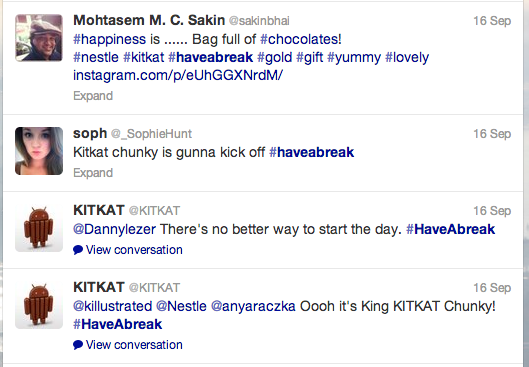 One note about the Kit Kat hashtag though: “have a break” is a common expression. It often gets more than just Kit Kat buyers posting to the tag. Make sure your brand hashtag stands out. Do the research, and create a brand hashtag that is relatively unique to your business. For a campaign hashtag, use the name of your current marketing campaign. For a campaign tag, again, make it a word or phrase that is unique to your short- term contest or promotion. Do your research. If they’re already really popular on a few social sites - like Instagram and Twitter - use a different campaign tag. Promote your campaign hashtags as a method for your customers to engage with you and your other customers throughout the duration of your special offer. 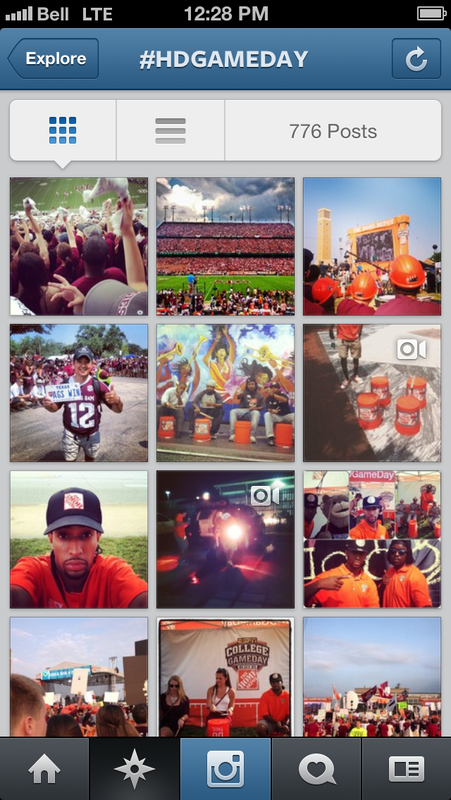 For example, include the use of your hashtag as a requirement to enter your contest. Home Depot is using the hashtag #HDgameday. 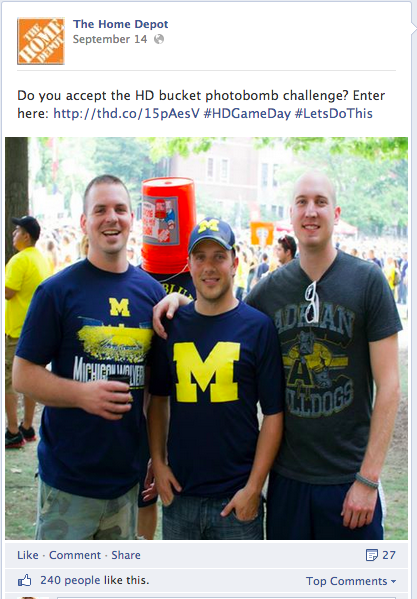 They are running a photo contest (using Wishpond's Facebook Contest Apps) of bucket drumming, to celebrate the start of college football. The campaign is being run through both Twitter and Instagram. 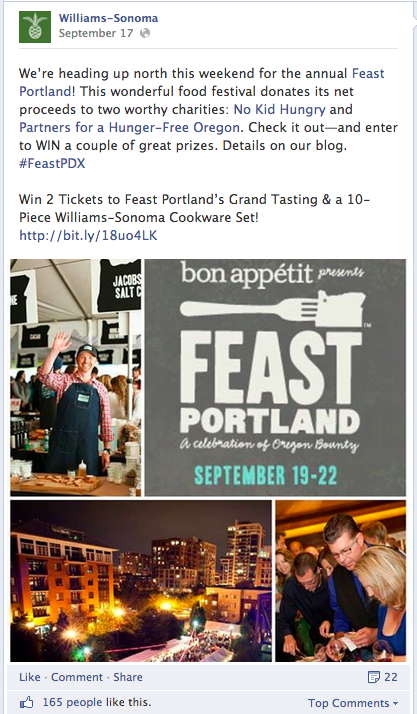 They’re also promoting photo winners on Facebook, and their website. They promote the campaign hashtag (and the contest) on all of their social sites. Keep your brand hashtag consistent and unique, and use it on all of your social sites. Make campaign hashtags for your social contests and promotions, to generate more engagement and awareness of your marketing efforts. Keep your business hashtags relatively short, so they’re easy to remember (and spell) for your consumers. Monitor your brand and campaign hashtags to respond to people using them. A trending hashtag is a hashtag topic that has become very popular. You’ve probably heard people talking about “what’s trending now”. They are often referring to the hashtags that are trending, or are the most talked about right now. Trending hashtags are continuously changing in real time. 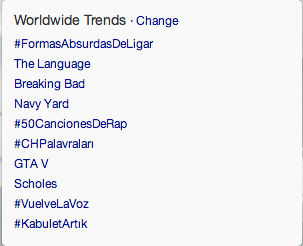 A top 10 trend can come and go within minutes, for example. When you see a trend that relates to your business, engage in it by using the tag. By using a trending tag in your content update, you can potentially get your message seen to a massive audience. Your content update can be seen by more than just your Fans and Followers - and it’s free. In a way, you could think of this strategy as getting your business’ 15 seconds of fame, or even (to some degree) getting a one second spot at the Super Bowl. Note: Do not spam trending hashtags. Posting to many trends - particularly when they are unrelated to your business - is viewed as poor etiquette. Spamming trends can actually get your Twitter account suspended. How do you find trending hashtags? At the moment, only Twitter and Google+ show you trending topics right on their sites. Twitter’s trends are generally transferable to Facebook and Instagram, and even to some extent Pinterest. Google+ are too, but you’ll often find more niche trends on G+, that are more site specific. Trends on Google Plus are in the “What’s Hot” section. Hashtags.org - You can find trending, declining and constant trends, as well as metrics about your social brand. Statigram - You can search for Instagram hashtags trends and get alternatives for hashtag words, so you can choose the most popular tags. Trendsmap - This site gives you a visual map to see geographic hashtag trends. As a local business, this is a great way to quickly know what’s trending in your area. Monitor trending tags by using the sites mentioned above. When you see a topic trending that is related to your business - make a content update, and include the hashtag. 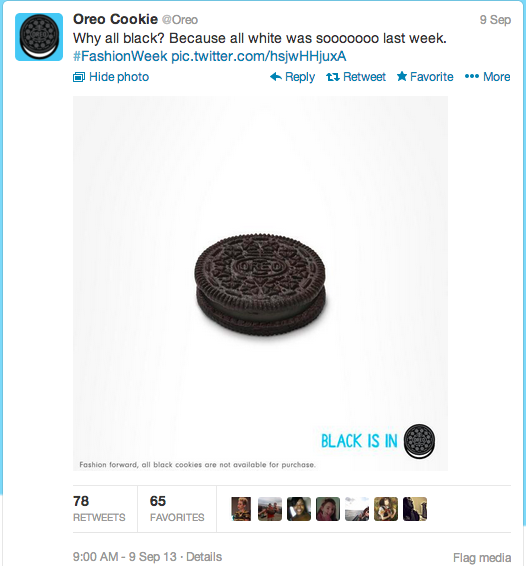 Oreo is known for their real time, trend-catching marketing. They were one of the first brands to tweet about the trending hashtag #SuperBowl #blackout. They also were on top of the Royal Baby trend. Their clever tweet marketing still gets them talked about today. Using a popular niche hashtag can get your post seen by a lot of like-minded people. Target your niche trending tags to get seen by your consumers who are also using the hashtag. This spreads the reach of his one post and further connects with his fans - and potential fans. Be quick in using trending tags to get more exposure for your content and brand. Find trending hashtags on Twitter, Google+ and other hashtag monitoring sites like hashtags.org, statigram, and trendsmap. Use niche trending hashtags to connect and develop relationships with your targeted market. Content hashtags are hashtags you use in your posts. They are not branded (and not used to define your business and marketing). They aren’t necessarily trending or highly popular. They are simply common hashtags that are related to your post content. Content hashtags improve the SEO of your posts. They get your updates seen by your consumers who are searching for, or using, the hashtag words. For example, at Wishpond, we use a lot of content hashtags like #socialmedia, #marketing or #Facebook. People search for common product tags. They use them too. When you post your products, think like your customer. Use hashtags that both connect your product and your market. You could also use common tags like #caffeinefix or #latteart. People want to connect with people who have common lifestyles. To market to your people, think about your demographics’ lifestyle and hobbies. Then seek out well used hashtags to include in a few of your updates. 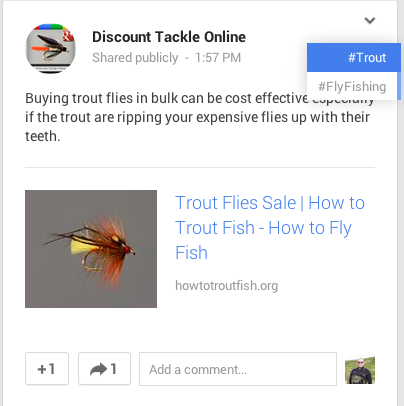 Discount Tackle Online uses common hashtags like #trout and #flyfishing on Google+. The post shows up in both hashtags streams, which gets their update seen by people who follow the fish related tags, or even search for them on the site. Event-based hashtags can be cool to include in a content update. An event could be anything from a local community fair, to a well known global celebration, to a live product launch or a live webinar you’re hosting online. If your business is taking part in a local event, for example, tell your social connections about it - and spread the word - by including the event hashtag in your post. If you are a locally based business, you need to connect with your local customers. Use specific geo-targeted hashtags to get your business known in your city. For example, if you are a local shop owner, use the hashtag of your town - and interact with your potential customers who are also using the town hashtag. Your updates will be seen by your local customers. Find common hashtags by check out what tags are being used by your followers, your competition and your product partners. Engage with people using related common hashtags - whether it’s a retweet on Twitter, a Like on Facebook, a comment on Instagram, and so on. Don’t ‘spam’ your posts with tons of common (or any) hashtags - this makes you look ‘salesy’ and does not instill trust with your consumer. Those are my three core hashtag marketing strategies. Expand the reach of your content updates. What do you think? 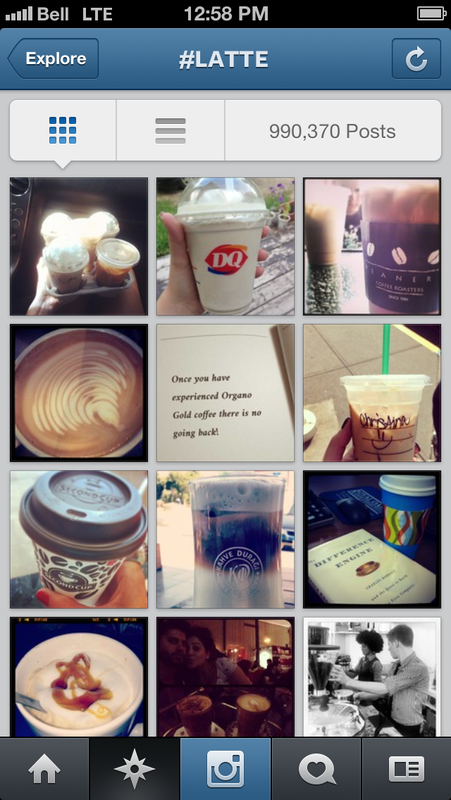 Do you use hashtags as a marketing tactic? What strategies do you use? What successes have you had?